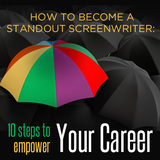 Screenwriter, script doctor, and consultant Mark Sanderson (aka Scriptcat) is a veteran of the screenwriting game with over fifteen years of experience. After graduating from UCLA Film School, he started writing and performing live sketch comedy with The Amazing Onionheads and writing for MTV. He eventually sold his first spec and followed with 11 writing assignments that have garnered six produced films—the emotionally compelling WWII indie I’ll Remember April, Lifetime Network’s An Accidental Christmas and Deck the Halls, the indie noir feature Stingers, and action-packed thrillers USS Poseidon: Phantom Below (aka Tides of War) and SyFy Network’s Sea Snakes (aka Silent Venom). Mark’s films have been distributed worldwide, premiered on Lifetime, SyFy, Fox Family, NBC Universal International, HereTV, and have opened and premiered at major film festivals. Mark’s long association with Hollywood veterans and award-winning filmmakers dates back to his first produced screenplay, and has since worked with Producer’s Guild of America nominees, legendary genre directors, and Academy Award, Emmy and Golden Globe acting nominees. His popular screenwriting blog www.scriptcat.wordpress.com was Script Magazine’s pick for “Website of the Week” and he offers screenplay consultation services on his website www.fiveoclockblue.net/SCREENPLAYCONSULTATION.php. He also teaches a new workshop, http://bit.ly/KldPlL, which is coming soon to Santa Monica, CA. In addition to these projects, Mark is busy editing his first book about survival as a screenwriter in Hollywood and shopping two TV pilots. From his list of projects in development come the films Last Christmas and Area 54 — two script assignments scheduled for production next year.